The easiest way to make fantastic photo collages for iOS and Android! Many templates to collage up to 9 into ONE frame. More than 50 free frames style: e.g sports, holiday, love and more are available. 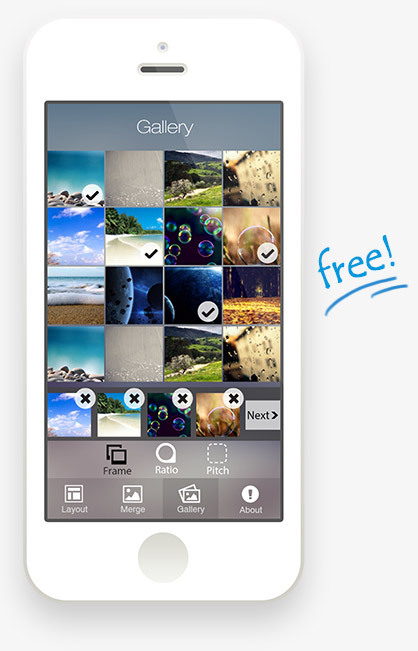 Select multiple photos from Camera Roll or Photo Albumn with ticks. Rotate, Flip, Pintch photos with two fingers before stitching it. Easy to add texts, words and captions onto the collage with tons of fonts styles, color, and text effects. Using stickers and emoji to say something. Alpha Mobile (IU-Apps) shall have no liability for conduct in relation to your use of the apps they have developed and released on Apple's App Store or Google's Google Play. You may not use their app for commercial purposes unless you are the copyright holder or you have obtained all necessary rights and licenses to use for commercial purposes all images and other material that make up your creation on or via their apps.